There are three major components to developing effective target marketing for sales results. First you have to clarify your market segments. Then you have to engage in data mining to verify the market opportunity really exists. Finally, link your target market to your operating, sales, and promotional strategies. 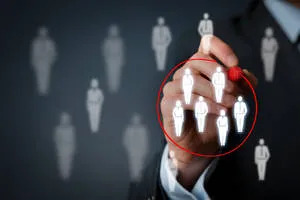 Target marketing typically incorporates an assessment of the demographics of your customer base. There are many demographic variables that can be easily identified and measured. A few examples for a consumer market include such aspects as age, gender, income, or marital status. Business customers can consider aspects such as employees, revenue, or years in operation. Knowing where your customers live or work is another method for evaluating your target market. Geography is typically combined with demographics to measure market size. The psychological profile is an exceptionally important variable in target marketing. Understanding your customer’s personality, buying motivations, and interests provide powerful opportunities to develop communication messages designed to trigger a buying response in your customer. Start by reviewing your internal customer data. Prepare historical summaries reflecting several years of data. Most people only look at one year of data — this is not sufficient to help you determine if your market has achieved its maximum potential or is on a decline. Look for trends and patterns. What types of profiles can you create of those who buy from you? When do they buy? Who is most profitable to you? Start evaluating how effectively your marketing approaches reach them and match their purchasing decision approach. Promotion must be customer oriented and matched to how, why, and when they buy. Where do they look for information to solve their problem or meet their need? It is not about what you want to sell them. You will need different marketing messages for those who are at the awareness stage gathering information than those who are ready to make a final purchase. Make your prospective customers understand how you will help them solve their problems or meet their needs by using your target-market insight to customize your promotional messages. Tie your promotions to their decision-making cycle and move them through their purchasing decision-making stages in a deliberate and effective manner. Heal their pain points! There are numerous promotional options beyond sales activities that can help you communicate with your target market. These include advertising, public relations, social media, collateral materials, direct mail, e-mail campaigns, website, tours, presentations, networking, participating in community events, open houses, trade fairs, using giveaways, and generating referrals from satisfied customers. The effectiveness of how you communicate your value to your customers and key referral sources will determine your ultimate marketing success. Communicate with them in the ways they expect. Develop a matrix to clearly define each target market you want and need to influence. Then identify how you will use each promotional opportunity to communicate with and influence each market segment. Using target marketing provides you with a disciplined approach to crafting highly effective marketing messages that have the potential to drastically influence your sales. The process of target marketing is ongoing and dynamic. You have to work hard to keep up with your market and discern when it is changing. Changes can be subtle. You will need to adjust your strategies to change with them or you may have to find new customers to remain a viable business. Jill J. Johnson is the president and founder of Johnson Consulting Services, a highly accomplished speaker, an award-winning management consultant, and author of the bestselling book Compounding Your Confidence. Jill helps her clients make critical business decisions and develop market-based strategic plans for turnarounds or growth. She has a proven track record of dealing with complex business issues and getting results. For more information on Jill J. Johnson, please visit www.jcs-usa.com.